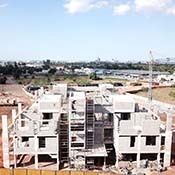 Construction of the Aga Khan Academy's new, purpose-built campus is underway! Visit this page regularly to see the progress of the construction. Click here to see the January 2019 construction photo gallery and video. Click here to see the November & December 2018 construction photo gallery. Click here to see the October 2018 construction photo gallery. Click here to see the September 2018 construction photo gallery. Click here to see the August 2018 construction photo gallery. Click here to see the July 2018 construction photo gallery. Click here to see the May 2018 construction photo gallery. Click here to see the photo gallery showing the construction of the student residences. Click here to see the October 2017 construction photo gallery.